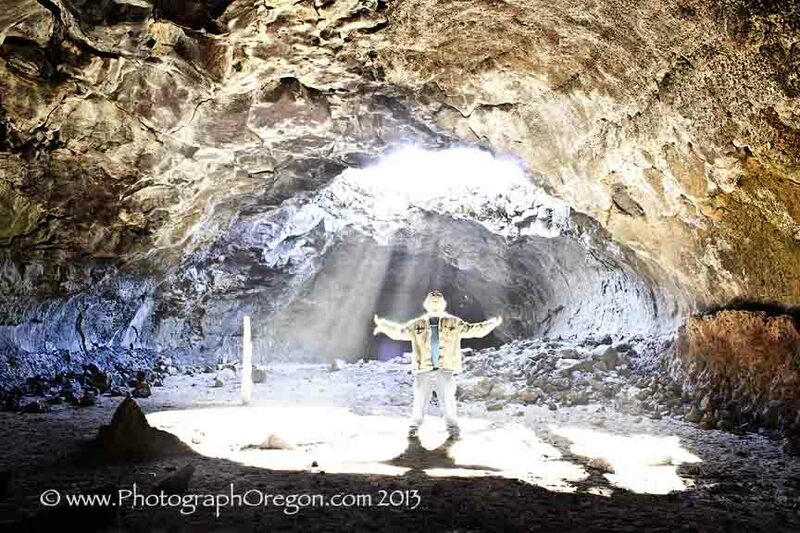 The pretty skylights lend themselves to alien abduction photos! There are several skylights in it which at the right time of day shoot beautiful beams down. There is a short end where the iron doors were (According to old maps approx. 600 ft long. But we ran in to a sandy blockage only maybe 200 ft back). The long end is truly wonderful. 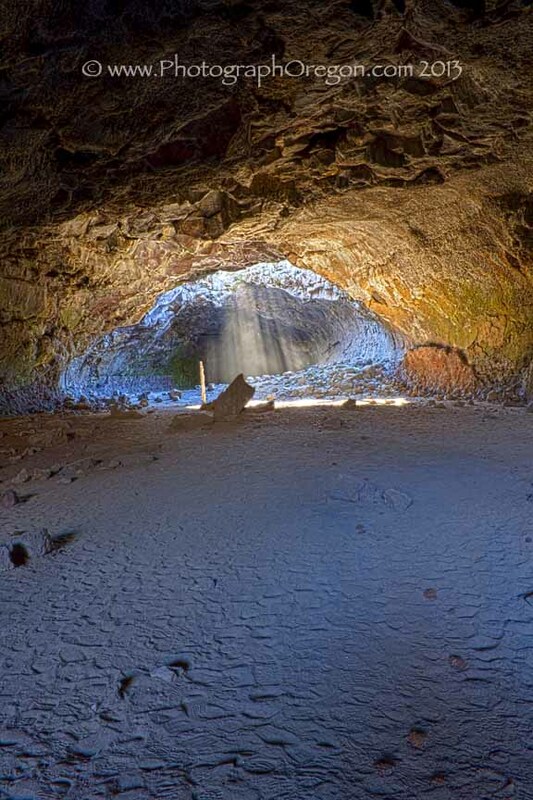 Lovely sandy floors and skylights drop in to a big keyhole tube that goes over 1000 ft. We, (Notice the “we”, never cave alone!) didn't go past the rock pile about half way down the long side, so we have some more exploring to do. The big keyhole section looks way more ominous than it is. It is stunning inside and the views looking back where the skylights are, area fantastic. It is also fun for light silhouettes and such. Derrick Cave was named after H.E. Derrick, a pioneer rancher with a homestead 3 miles southeast of the cave. 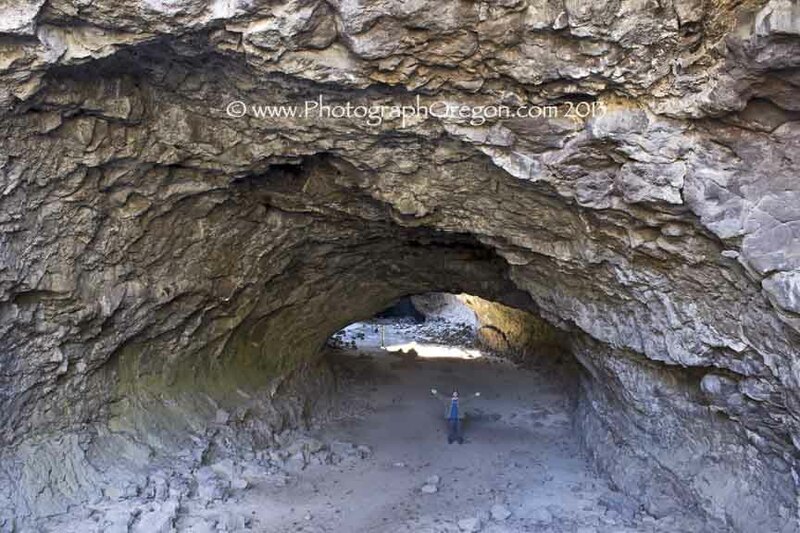 The cave is on BLM land and under their care. 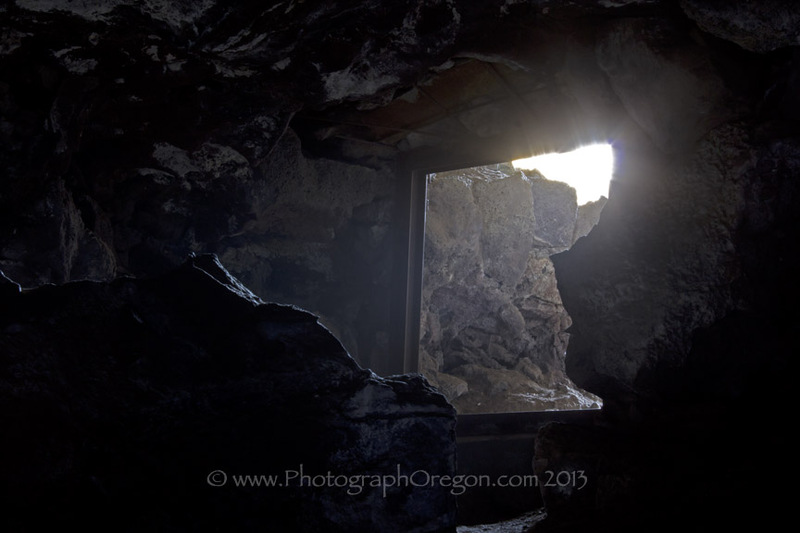 Early homesteaders from Fort Rock used the cave as a summer recreation site. Families used the ice found in the cavern to make ice cream, which was a rare treat in those days. 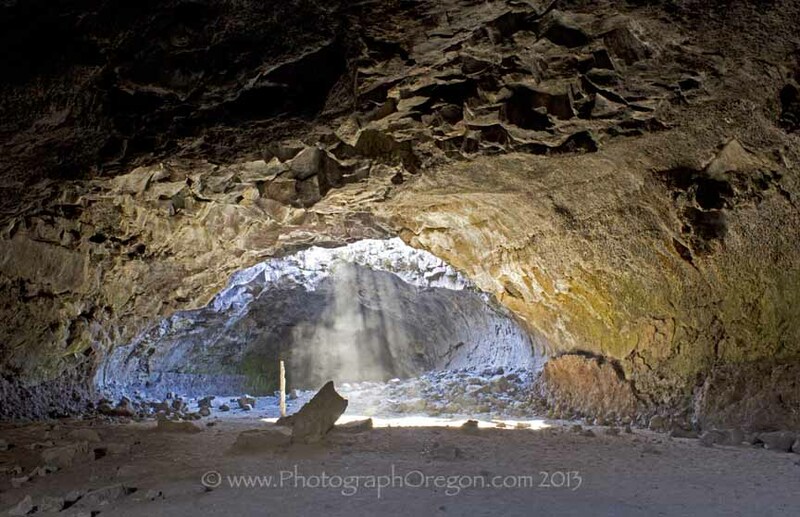 In the early days of World War II, local residents planned to use this cave as an air-raid shelter should the Japanese start bombing raids on the west coast. In 1963 Derrick Cave was designated as a nuclear fallout shelter. 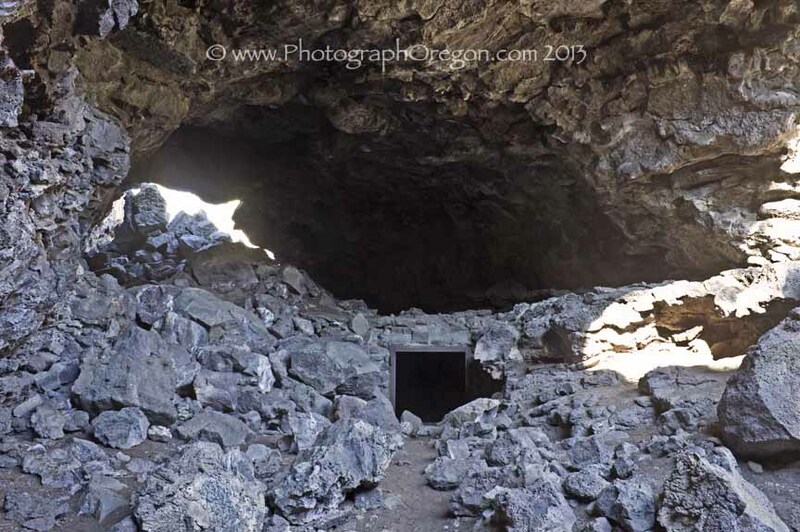 Stored in the small end of the cave behind a locked steel door was a cache of food and water for up to 1,200 people, however, word got out quick and vandals broke into the supply vault on and over time, made off with everything, including the doors. They left the civil defense water cans, likely because they had frozen solid and were too heavy to carry out. 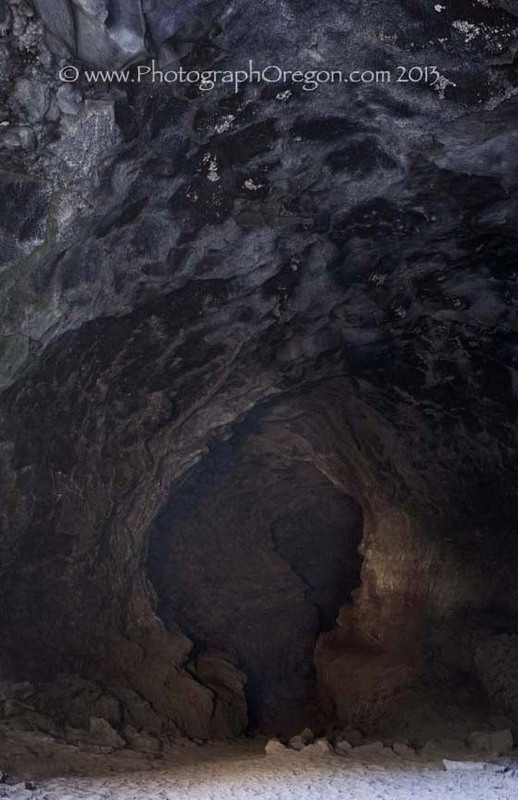 NASA also used this cave in the 1960s.They were in the stages of planning lunar landings and wanted a way to locate underground spaces that astronauts could use if need be. 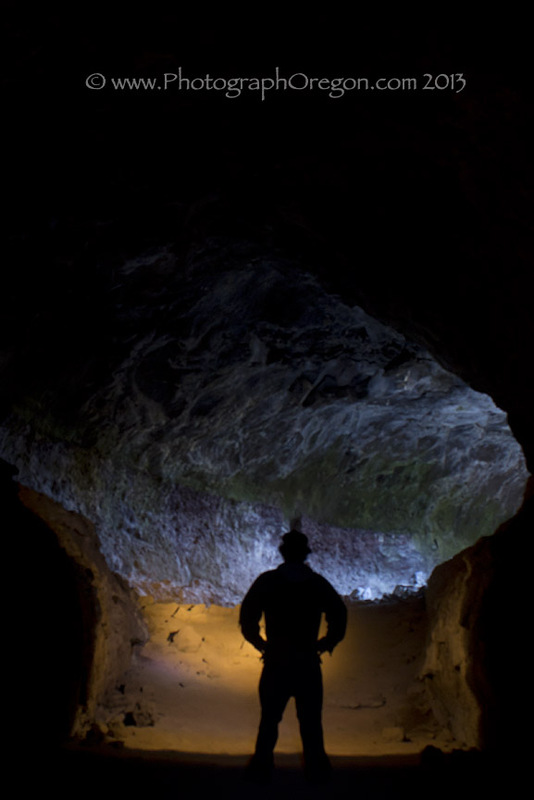 They wanted to see if using gravimetric instruments underground caverns could be detected from high altitude. In support of NASA experiments, using Derrick Cave as the underground target, North American Aviation and Pacific Northwest Bell conducted high altitude gravimetric tests. They loaded 2000 pounds of steel railroad rails in about 200 feet past the last skylight. An airplane was deployed to see if the rails could be located from the air with the gravimetric instruments. They also poured gasoline on them and lit them up doing the same style of experiments. When they were finished they left everything there, but eventually people removed them. Thank goodness, as the sandy floor now is lovely. 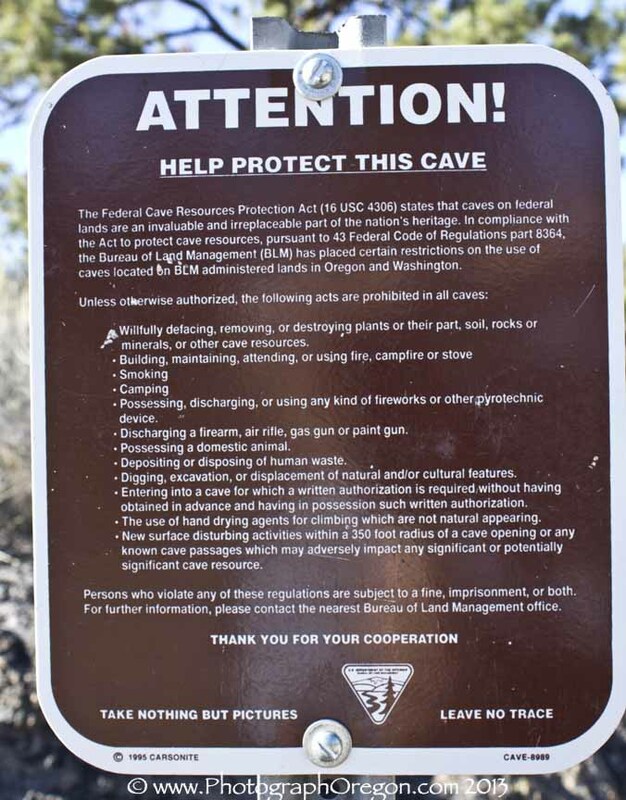 In 1994, the Bureau of Land Management issued some actual rules for this cave. The cave is closed to camping, camp fires, and smoking. Also, large group gatherings are discouraged as they raise the temperature inside the cave which disturbs bats and fragile microorganisms. Climbing with bolts is prohibited. The rules are posted on a sign near the entrance to the cave. 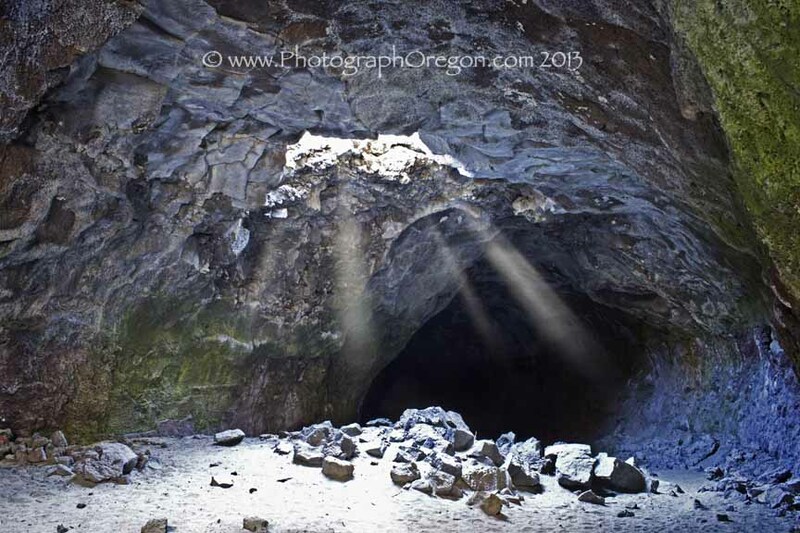 Derrick Cave is open to the public year-round.